I’m talking about coaches & consultants. These are the people who get paid big bucks to solve problems for other people. Now, maybe you've been wanting to start a business before but you're not sure what to do or where to start. ...you can get paid a lot of money for helping people get where they want to be! The business model is simple and straightforward, and you can still make a massive impact—on both your clients and you. We’re giving away the tactics we’ve used over the years to land clients, get paid, and monetize our skillsets. 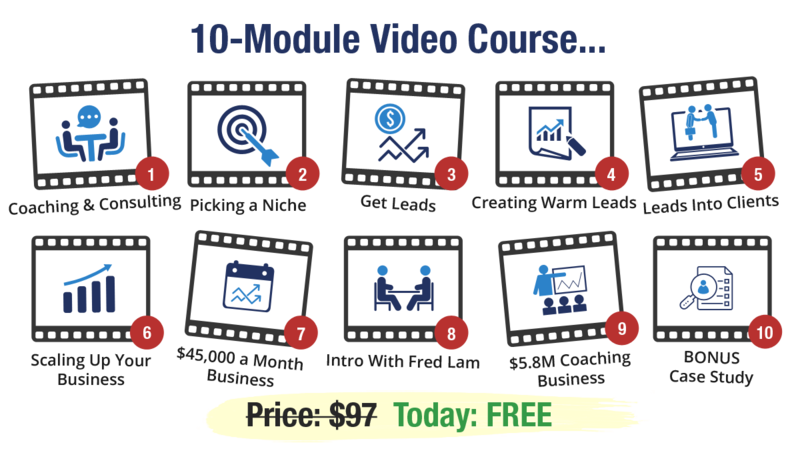 These 10 videos walk you through picking your niche, finding clients, scaling up, and we even show you how one man built a $45k a month consulting business from scratch in only 60 days. Join us in the Bootcamp, and get a special invitation to our free coaching and consulting webinar. When you show up to the webinar LIVE, we’ll go EVEN DEEPER into our coaching & consulting tactics, and how they can be used to start landing high-paying clients in just a few days. We’re not going to just throw jargon at you, get you “excited,” and leave you to figure out this coaching & consulting thing on your own. When you dive into the bootcamp and the LIVE trainings, you’ll get access to every resource you need to start this business, grow it, and scale it successfully. Want to See How to Get Your 1st High-Paying Client?